Next Home ware Wish List. I am in the mood for re decorating my house, now that it is Autumn. This is one of my favourite times of the year, cosy and warm house with candles burning. I thought I would put together a wish list of some of the things I am wanting to update my house. For our house I think it needs small touches to make it that bit more homely. We have a big empty wall in our lounge that I would like to fill with art work and mirrors. I have found a few that I would like to use in my lounge and the hare one in my bedroom. We have a woodland theme in our room at the moment. We also usually have white sheets so adding in woodland features will still look great with white bedding. I would also like this hare cushion to add onto our bed. Our house needs some small updates like new candles and new throws for the bed and lounge. I love nothing more than a cosy house that feels relaxed. Going off the theme wood land I would love this beautiful orange tree to go in our bedroom. I love that it has fairy lights in it. I think this would complete our bedroom. As I have two dogs, nothing goes without thinking of them too. I love this rug that we could put in our porch. We go on long winter walks in our wellies which is great, coming home to drink hot chocolates. I am a fan of the Next home ware they have so many items I would love to add into my house. I also like to shop in Home Sense for bits and bobs, I have recently found so many cute things in there. It is a great shop for seasonal items, I love to go in nearer to Christmas. I would love to update my house with cushions, lights and candles soon. What would you like to add to your room or house? 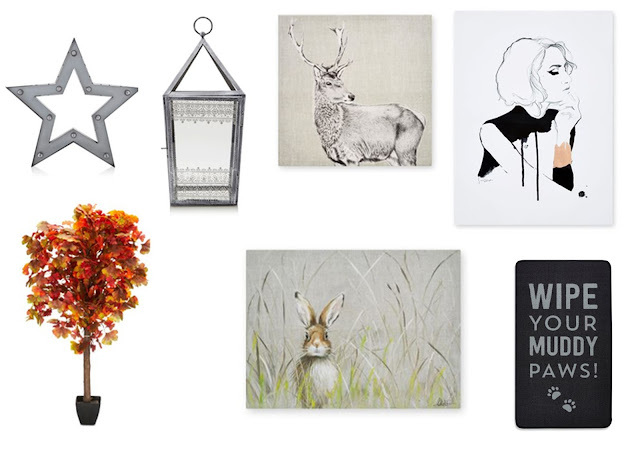 The hare canvas is gorgeous! I keep eyeing up new throws for cuddling up in now that it's getting colder, not that I need any more than I already have aha. I love Next Home and Home Sense too!